An obstructed dryer duct can quickly bring about hazardous conditions within your dryer which can eventually result in a dryer fire. Below is a common dryer venting problem in which the flexible dryer venting connector behind the dryer is crushed. This results in long drying times and can lead to expensive dryer damage and a dryer fire if left unaddressed. 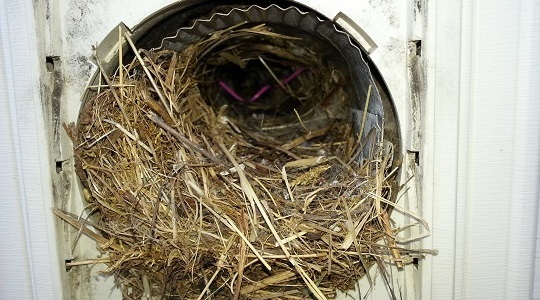 This entry was posted in Dryer Vent Cleaning and tagged Birds Nest, Dryer fire, dryer vent cleaning, Fire hazzard, Lint, Memorable Air Care, nadca, New jersey, nj on July 22, 2017 by Jeff Miranda. Get FREE dryer vent cleaning with a whole house air duct cleaning service at standard rate. Can not be combined with flat rate or other offers. Get the latest specials and promotions from memorable air care in your inbox! Serving all of Monmouth, Ocean and Mercer Counties NJ Freehold, Manalapan, Millstone, Marlboro, Monroe, Colts Neck, Holmdel, Middletown, Rumson, Belmar, Spring Lake, Manasquan, Howell, Allentown, Jackson, Morganville, Brick, Toms River, Manchester, Lakewood, and other towns throughout the area.